The Indian Ocean Biodiversity Assessment 2000-2005 reviewed the biogeography of the Seychelles islands through systematic collecting of all taxonomic groups. Biodiversity collecting for this assessment started in 2000 under a Memorandum of Understanding with the Seychelles government with taxonomic support from 87 expert taxonomists in 20 countries. These taxonomists reported the identification of a large number of previously undescribed species and the material initiated taxonomic revisions of most of the groups concerned. These revisions are being published in widely dispersed academic journals, most of which are not available in Seychelles. The only comprehensive taxonomic treatments available cover dicotyledon plants and vertebrates. The information generated by the project has been collated into a monographic series on the Seychelles fauna. 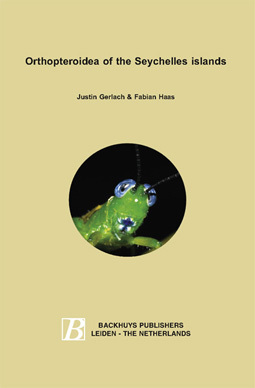 The aim of these monographs is to disseminate taxonomic information in a form that can be easily utilised by future workers in the region and by conservationists and researchers in Seychelles. This high quality biodiversity information is essential for future sustainable biodiversity management. Further details of the Indian Ocean Biodiversity Assessment can be found on the Nature Protection Trust of Seychelles web-site: http://members.aol.com/jstgerlach. two main groups; the northern granitic islands and the southern, coralline islands (Fig. 1-2). The following account concerns all species of Orthopteroidea recorded in the islands. (33 species, 11 endemic). Lower levels of diversity are found on the smaller coral islands (e.g. Asian or Indo-Pacific, 12% Pantropical and 10% Cosmopolitan. species have not been assessed. the plates represents 1cm. Characters used in identification are shown in Fig. 3.